Feme: How to integrate different perceptions for shark conservation? How to integrate different perceptions for shark conservation? Sharks are amazing animals that have been living on the Earth for hundreds of millions of years (waaaaayyy older than humans!!!). Today, there are over 500 species of all shapes, colors, sizes and behaviors. For example, the dwarf lanternshark (Etmopterus perryi) is the smallest shark known to science with adults reaching a maximum of 20 centimeters, whereas the much more famous whale shark (Rhincodon typus) can reach up to 12meters! Sharks are top predators that regulate populations of other species and help maintain healthy marine ecosystems worldwide. Despite their key importance for the world oceans, shark populations are rapidly declining all over the globe, especially due to the Asian taste for shark fins, which kills 100 million sharks per year. This decline is also worsened by the reproductive strategies of most shark species, marked by slow growth, late sexual maturity and small offspring, features that make it difficult for them to recover from the high mortality caused by commercial fishing. In this scenario, global conservation strategies are needed to help shark populations recover and thrive in the oceans. However, the completely unjustified negative image that the general public has of sharks (“human-eaters and murderers”) does not help conservation efforts. In a recent article, we have investigated the knowledge and attitude of residents and tourists towards shark species of Fernando de Noronha Archipelago, a marine protected area, and one of the major ecotourism destinations in Brazil, famous for shark-watching tourism. We interviewed 178 residents and 277 tourists in the main island of the archipelago. We showed that residents and tourists have slightly different perception and attitude towards shark conservation: while residents know much more about the local shark species (Fig. 1), tourists are more aware of the fact that some shark species are endangered. 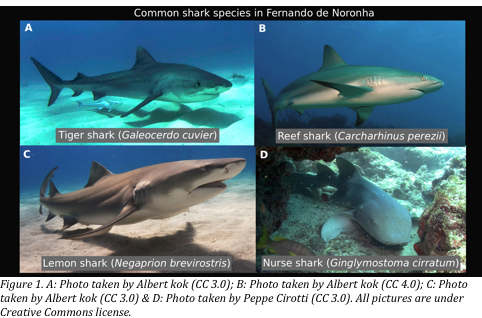 While the majority of residents know that Fernando de Noronha is an important birth and mating area and a great site to observe sharks, tourists are more likely to agree that shark fishing should be prohibited and that fishing other species could harm shark populations in the island. Nevertheless, both residents and tourists believe that it is important to protect shark species and are aware of their ecological role in marine ecosystems. Such different perceptions are important when developing conservation strategies for sharks. We suggested, for example, (I) offering shark-watching experiences for residents guided by local scuba diving operators. This would provide the residents a chance to enjoy the marine environment and sharks, which are usually enjoyed by tourists only. (ii) Shark-watching could be included as part of schooling activities for children and teenagers. These schooling activities are expected to increase the residents' awareness of sharks and increase the success of shark conservation. (iii) The training of residents as local scuba divers and snorkeling guides could strengthen their participation in tourism and engage them in conservation and environmentally driven attitudes. (iv) We also suggested integrating residents’ knowledge of sharks into educational material for tourists in order to improve their knowledge of local shark species and provide clear orientations during shark-watching activities. In conclusion, we found that individual values may differ between visitors and residents, which demand the development of integrated management strategies capable of bringing conservation issues to different segments of the society.